Scott Eidler reported on the U.S. 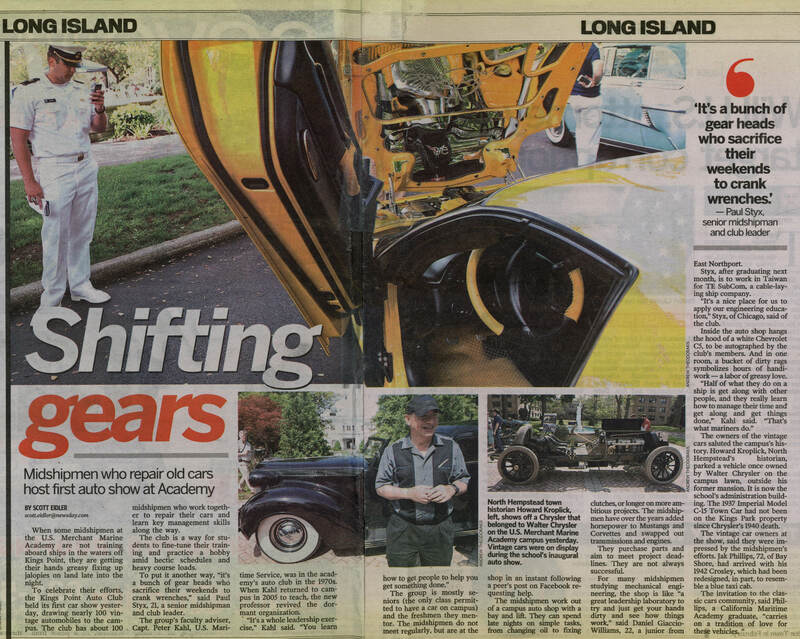 Merchant Marine Academy Car Show in yesterday's Newsday. Photos of this amazing historic event will soon be posted. When some midshipmen at the U.S. Merchant Marine Academy are not training aboard ships in the waters off Kings Point, they are getting their hands greasy fixing up jalopies on land late into the night. 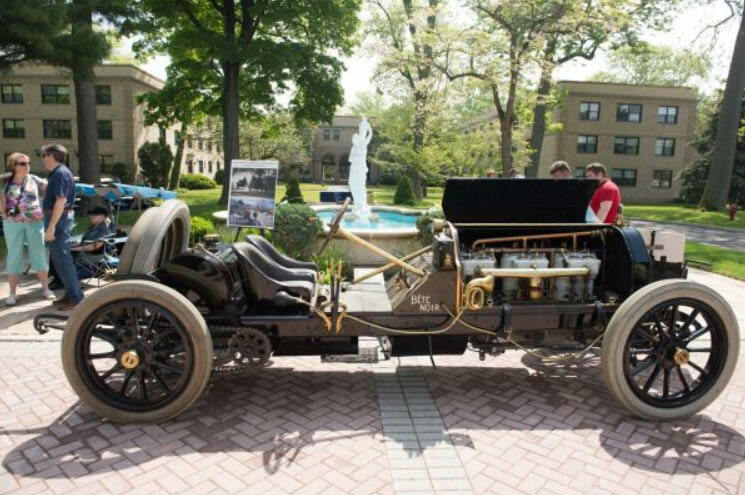 To celebrate their efforts, the Kings Point Auto Club held its first car show Sunday, drawing nearly 100 vintage automobiles to the campus. The club has about 100 midshipmen who work together to repair their cars and learn key management skills along the way. The club is a way for students to fine-tune their training and practice a hobby amid hectic schedules and heavy course loads. To put it another way, "it's a bunch of gear heads who sacrifice their weekends to crank wrenches," said Paul Styx, 21, a senior midshipman and club leader. The group's faculty adviser, Capt. 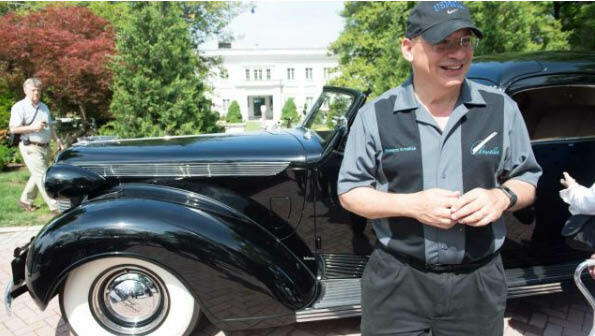 Peter Kahl, U.S. Maritime Service, was in the academy's auto club in the 1970s. When Kahl returned to campus in 2005 to teach, the new professor revived the dormant organization. "It's a whole leadership exercise," Kahl said. "You learn how to get people to help you get something done." The group is mostly seniors (the only class permitted to have a car on campus) and the freshmen they mentor. The midshipmen do not meet regularly, but are at the shop in an instant following a peer's post on Facebook requesting help. The midshipmen work out of a campus auto shop with a bay and lift. They can spend late nights on simple tasks, from changing oil to fixing clutches, or longer on more ambitious projects. The midshipmen have over the years added horsepower to Mustangs and Corvettes and swapped out transmissions and engines. They purchase parts and aim to meet project deadlines. They are not always successful. For many midshipmen studying mechanical engineering, the shop is like "a great leadership laboratory to try and just get your hands dirty and see how things work," said Daniel Giaccio-Williams, 22, a junior from East Northport. Styx, after graduating next month, is to work in Taiwan for TE SubCom, a cable-laying ship company. "It's a nice place for us to apply our engineering education," Styx, of Chicago, said of the club. Inside the auto shop hangs the hood of a white Chevrolet C5, to be autographed by the club's members. And in one room, a bucket of dirty rags symbolizes hours of handiwork -- a labor of greasy love.